In this film we follow Paul to Majorca, an island in which he spent much of his life. 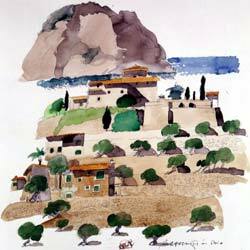 Here he produces three fascinating watercolours, drawn on the spot and painted in his studio on the island. 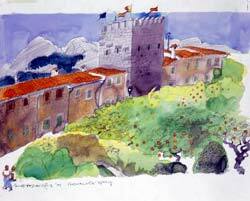 He also introduces us to some of the many places he has painted in the past. Back in England we see him working in his studio and look at some of the many paintings, drawings and lithographs he has produced over the years. Spirit of Place is one of a number of 'Royal Academy Collection' films, which feature Royal Academicians. It covers the work of the watercolourist Paul Hogarth and provides a fascinating insight into the man and his work. In his amiable and laid-back style, Paul talks about his times as an illustrator working in the USA, England and Russia, with authors such as Brendan Behan, Robert Graves and Graham Greene, and we see examples of illustrations and other work he completed at the time. The video then moves on to Majorca where we see Paul drawing a number of scenes on location, which are later developed into finished works in his Majorcan studio and in his studio at home. After some preliminary planning, he draws in pencil in great detail on a large sheet of paper. He explains that he does not intend his work to be a copy of the scene, but enjoys inventing and changing things to suit his composition and interpretation. This completed, he returns to his studio where firstly he applies Indian ink washes to create a monotone underpainting, before washing colour over this, and letting the Indian ink provide the tone. Paul's current work has a quirky freshness and appeal - a cross between Raoul Dufy and Naive painting. Watching Paul work is enlightening. Apart from witnessing his draughtmanship and creativity, we see his methods - from combining ruler with free drawing to 'increase tension' - to dabbing away unwanted passages with a kitchen scourer. An enjoyable and informative video. 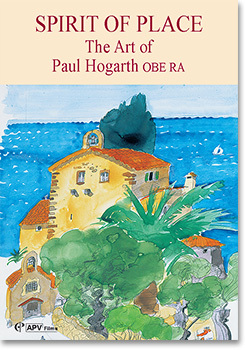 If it's inspiration you lack, then I recommend Paul Hogarth�s film, Spirit of Place The Art of Paul Hogarth OBE RA which is mostly shot in Majorca, an island in which he has spent much of his life and to which he still returns regularly. A love of travel has led Paul Hogarth to make drawings and watercolours of events and places all over the world and he is a distinguished painter. This film gives us a privileged insight into his working methods showing how he makes sketches and notes on the spot and how these are subsequently developed with watercolour washes, pen and ink work and other techniques in the studio. We see three wonderfully lively and individual watercolours made in this way, are shown other places and pictures that he has painted in the past, and learn something about his lithographs and other work. Also in APV's Royal Academy Collection there is an excellent film by the late Paul Hogarth OBE RA. In Spirit of Place, we join Paul in Majorca, an island where he spent much of his life, and here we learn about his love of travel and the methods that he would use to create the stunning book illustrations, watercolours and lithographs that earned him international acclaim. I love this film! Paul Hogarth is an inspirational artist. After seeing this APV DVD, I fell in love with his unique style and bought the accompanying book and then many of his numerous out-of-print books online. Hogarth challenged the norm - for example, he did not use conventional perspective and he was not a conventional watercolourist. He makes you think. Some may try to pigeon hole him as merely an illustrator but his books show him to be much, much more than this. It is a pity that this film is only 60 minutes - if only APV could extend it and include all the material that landed on the cutting room floor. With Paul Hogarth, the material that was not included is of historical interest, because he is as an internationally famous artist. How about it, APV? What a pity he died before a second DVD could be commissioned. I really love Paul Hogarth's work and I enjoyed watching him at work on this DVD. Keep in mind that this, however, is not so much an instructional film as the artist doesn't share much practical knowledge about the way he composes the images. It is always good to see the ideas behind the finished work and that is what I expect to see and enjoy most about such films.